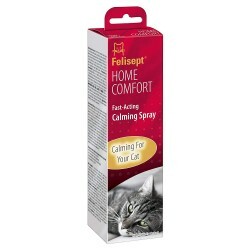 Keep your scaredy-cat calm with Felisept solutions. Unlike other feline anxiety relievers, Felisept is a natural stress-reliever for all breeds, colors, and sizes of cat. 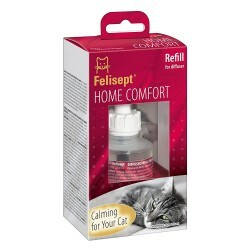 Instead of featuring imitations of natural feline pheromones, Felisept is made with an extract of the catnip plant (a member of the mint family), which naturally provides cats and other feline species with a sense of calm. When used in an unfamiliar or stress-inducing environment, such as a car, carrier, or new home, Felisept helps curb unwanted behaviors, such as scratching and urination. Use Felisept Spray for targeted calming on the go and plug in a Felisept Diffuser to provide a long-lasting calming environment in your home. 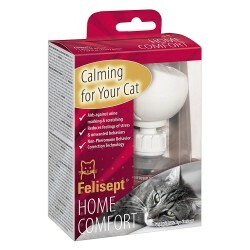 No matter what situation causes anxiety for your cat, Felisept has the solution you need.